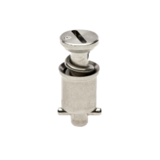 These Slotted Head studs feature MilSpec's unique enclosed (collared) slot which prevents the screwdriver from slipping out and potentially damaging the panel. They are DFARS compliant stainless with a bright and shiny passivated finish as per AMS2700 which offers excellent corrosion resistance. Additional lengths and other finishes are available upon request (minimums may apply). 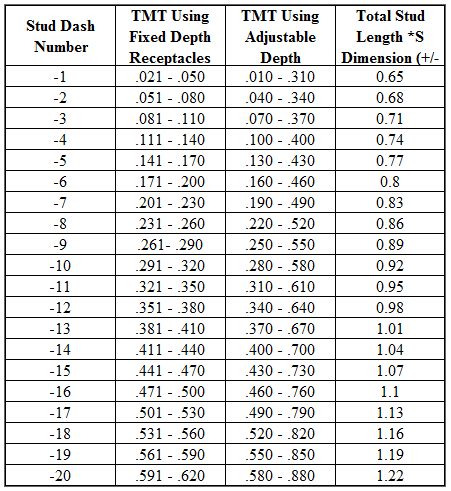 Sizing Chart :For your reference, we have included a chart at the bottom of this page which shows the panel thickness ranges and corresponding stud lengths when used with fixed depth or adjustable depth receptacles. Price Breaks :The per each price is displayed with the product. Quantity based discount prices are automatically generated and shown when the item is added to the shopping cart. The breaks are at the following quantities: Each, 50, 100, 250, 500 and 1000. Please Contact Us for a quote on larger quantities.